The best garage door opener is the Chamberlain B970 Belt Drive Wi-Fi Garage Door Opener with integrated smartphone control and battery backup. This unit features Chamberlain's 1 1/4 HP ultra-quiet motor with a steel-reinforced belt for smooth, reliable operation and battery backup to operate during power failures. Built in Wi-Fi with MyQ technology allows you to control the garage door opener from your smartphone with no additional accessories. Included in the package: two remotes, one outside keypad, safety sensors, battery backup, and inside wall button with timer to close feature making this the best garage door opener. 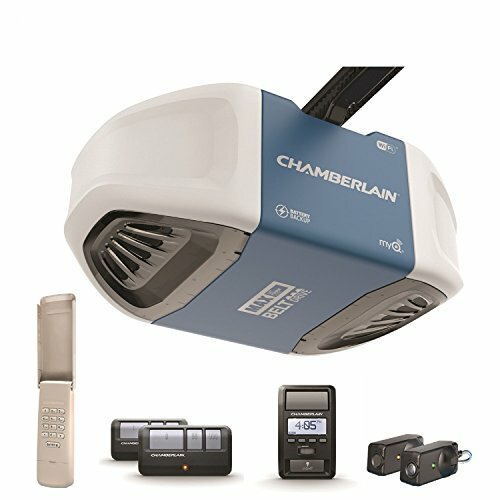 Why Is Chamberlain the Best Garage Door Opener? Chamberlain garage door openers are the best because they manufacture ultra-quiet reliable automatic openers with innovative safety, convenience, and smartphone features. They have been making openers for decades under the Chamberlain and LiftMaster names as well as private label for many companies. Their garage door openers have excellent parts support and they continue to be industry leaders with the introduction of their Wi-Fi units. They include great features such as timer to close, one touch to close outside keypads, and battery backup integration for the ultimate in safety and security. Battery backup integration in Chamberlain garage door openers makes for a seamless experience when opening and closing your garage door during a power outage. The integrated battery is tucked away inside the motor housing and stays charged while the unit is plugged in. If the power goes out, the backup battery will power your garage door opener so you are not left stranded or stuck. This is a great convenience feature that we discuss in detail later in the article. Chamberlain was one of the first companies to introduce smartphone capable garage door openers that allow you to control and monitor your garage door from anywhere in the world. Their MyQ smartphone app has proven to be very reliable and continues to be updated and supported. They are years ahead of any other garage door opener company in this regard. The MyQ app allows you to set daily schedules which will close your garage door at a certain time after it has been opened. This is a great way to keep your home secure when you are away. Built in Wi-Fi allows you to open or close and monitor your garage door from your smartphone with email or push notifications. Really cool stuff! The Chamberlain B970 Belt Drive Wi-Fi Garage Door Opener features the 1 1/4 HP Max Lift Power System designed to work in excessive heat, cold, and humidity. The Max Lift System has the highest lifting capacity in its category in North America and features anti-vibration technology to ensure quiet, smooth operation. Being able to generate the lifting force equivalent to 1 1/4 HP gives this unit ice break strength to help break free a garage door frozen to the ground. The Chamberlain Max Motor is designed to lift the heaviest garage doors including carriage house wood and steel back insulated garage doors while providing a lifetime motor warranty. Larger garage doors have more mass which makes it hard on garage door openers to open and close as it takes power to get the weight moving down the tracks. The Max Lift Power System is designed to handle these loads on a daily basis ensuring your garage door will always perform at its best. In recent years, Chamberlain has introduced DC (direct current) motors in many of their U.S. based garage door openers. DC motors have been used for many years throughout Europe and now finally the United States is taking advantage of this technology. DC motors are extremely quiet when running and they allow for soft starting/stopping when the unit is in operation. What this means is the garage door opener will take off slowly on initial start and pick up speed and then slow down right before the end of its cycle. This makes for much quieter operation when the garage door opener is activated and it reduces wear and tear on your garage door commonly seen from traditional AC motor garage door openers. Traditional AC motors are either on or off. When you hit the button they are going full speed until the cycle is complete. The instant full speed jerk will wear a garage door prematurely over time whereas a DC motor has a more gentle touch. This increases the life of your garage door... especially the area where the garage door opener pick up arm connects to the stile on the door. Another great feature of garage door openers with DC motors is they do not have a starting capacitor. A starting capacitor is a part that stores energy to help a traditional AC motor get running. Not having this part is one less item you have to worry about replacing if the garage door opener is ran too many times in a row… especially in a hot climate. Modern garage door openers with DC motors utilize electronic force and travel limits that are built into the circuit board. This is a great feature because the circuit board will always analyze the last few cycles and make adjustments. This is great for changing weather conditions when a garage door might be a little more hesitant to roll especially in extreme cold climates. Also, not having physical travel limits will eliminate travel problems some garage door openers have when corrosion builds up inside the motor head on the travel assembly. Chamberlain garage door openers utilize a super quiet belt drive system for the ultimate in noise reduction. The drive belt is made of high quality materials using rubber and reinforced with steel for years of worry free operation. Belt drive garage door openers provide ultra-quiet performance since there is no metal on metal when in operation which is great for attached garages… especially if there is a bedroom next to the garage. The rubber belt also acts as a shock absorber while in use. This allows a little give when running your garage door up and down which will reduce wear and tear on your automatic opener and door. Reducing wear on your garage door system means everything will run worry free for a longer period of time therefore saving you money. Couple this with a lifetime belt warranty and you have a super quiet garage door opener backed by one of the best warranties in the business. The free Chamberlain MyQ app allows you to control and monitor your Wi-Fi garage door opener from your smartphone with no monthly fees. This control allows you to let someone into your home without giving them a key to your front door or the pin number to your outside keypad. This is great for house keepers, the repairman, or your dog walker. Another great benefit of receiving notifications on your smart phone when the garage door opens is being able to monitor when your kids come home. Many parents know the general time of day when their kid comes home and they will receive a push notification when the garage door has opened. This is a great way to rest assured your kids have arrived home safely. The Chamberlain MyQ app allows you to control and schedule your garage door and MyQ lighting. You can set schedules in the app to turn lights on and off and close your garage door at preset times to keep your home secure, especially when you’re away on a trip. There are integrations with third party partner apps such as Google Assistant and IFTTT that would require a monthly fee if you want to control your garage door with your voice or through their automation software. If you only use the MyQ app, there are no monthly fees. We use the MyQ app on a daily basis and find it more than sufficient at controlling and monitoring our garage door without having to connect it to a third party service. With the growing number of power outages and wild fires plaguing communities, having a battery backup garage door opener that will operate when the electrical power is out is not only convenient but can save lives as well. Chamberlain has been leading the way with battery backup integration in their garage door openers for years. This feature can save lives in case of a natural disaster by allowing the homeowner to open their garage door when the power goes out. The state of California introduced legislation that would mandate all new garage door openers installed in residential homes be required to have a battery backup so there is an egress point during a wild fire or other natural disaster. There were many homeowners that we’re told to evacuate during a wild fire and we’re not able to open their garage door due to the power going out. Garage door openers feature a red emergency release cord but many homeowners do not understand how they work and combine that with a heavy garage door that has not been properly maintained and you have a recipe for disaster. The backup battery in garage door openers will eventually need to be replaced and when that time comes the opener will make a loud beeping noise alerting you it’s time to replace the battery. This built in feature is great so you don’t have to worry about when is the right time to replace the battery. Many homes do not have sufficient lighting in the garage so having an opener with two motion activated light bulbs will help when you enter the garage. The deluxe wall button included with this unit has a motion sensor that will turn on the two light bulbs for 4 1/2 minutes as soon as it detects motion in the garage. This will give you plenty of time to grab something from the garage without having to flip a switch on and off and prevents anyone from leaving the garage light on. If you need more light, the Chamberlain B970 Belt Drive Wi-Fi Garage Door Opener comes with a wall button that is mounted inside the garage and hard wired to the motor head. There is a light button on the wall console that allows you to control the two lights on the motor head manually. The lights will stay on until you press the light button again or run the unit from the wall console or remote. Another great convenience feature for a poorly lit garage. Chamberlain claims you can use 100 watt incandescent light bulbs. We recommend not using an incandescent light bulb over 75 watts. We have seen incandescent light bulbs melt the housing and light cover due to excessive heat output by the bulb. Genie company released a new LED light bulb made exclusively for garage doors openers. This bulb provides great light output while eliminating interference that is commonly found with LED bulbs and garage door opener remotes. While we don’t recommend Genie garage door openers, their new LED Garage Door Opener Light Bulb is a quality product that is rated to last 25,000 hours and withstand the vibration created by the opener motor. One feature that is seldom talked about but quickly becomes a favorite for many home owners is the light activation when you cross the safety sensor beam. This is popular with many home owners that like to sit outside in the evenings with their garage door open. The light on the garage door opener will activate when somethings crosses the beam. The light will stay on for the normal 4 1/2 minutes and the light timer will reset everything when the beam is broken. It is a small hidden feature that many Chamberlain owners are very fond of. Chamberlain garage door openers feature a Motor Vibration Isolation System to help eliminate unwanted vibration and noise. This is especially important if there is a bedroom, living space, or nursery close to the garage. The hanging brackets for the garage door opener are attached to the ceiling joists. When a garage door opener has excessive vibration, this gets transferred up through the hanging brackets and into the structure of the home. This vibration is loud enough to wake anyone sleeping or relaxing in a bedroom nearby. The Motor Vibration Isolation System offered by Chamberlain eliminates the noise and vibration that is transferred through the garage door opener hanging brackets. This results in a much more pleasant experience for all who are living in the home and allows you to open and close your garage door at all times of day not having to worry about who you are going to disrupt. The Chamberlain B970 Belt Drive Wi-Fi Garage Door Opener comes with two long range Security 2.0 remotes with Triband technology which boosts range up to 1,500 feet for quicker entrance and exit into the garage. Each remote has three buttons and can be programmed to all Chamberlain, LiftMaster, or Sears garage door openers manufactured after Jan. 1st, 1993. The remotes are also capable of operating MyQ lighting and LiftMaster gate openers. The remote uses CR2032 batteries that can be replaced using the visor clip included to pop open the case. The outdoor wireless keypad included provides convenient access to your garage when coming home or working in the yard. The flip up cover offers protection from the weather while the backlit keys allow for use in low light conditions. A temporary pin number can be programmed to allow limited access for guests or workers. The best feature of all is the one-touch to close which allows you to close your garage door by pressing the enter button. This eliminates you from having to enter your four digit pin every time you leave for a more efficient exit. The keypad uses a 9V battery that can be replaced easily with no tools. The wall button included with the Chamberlain B970 Belt Drive Wi-Fi Garage Door Opener features a digital read out that tells temperature and time. The unit is designed so you can program remotes and keypads from the wall button. A motion sensor will turn on the lights when motion is detected and the dedicated light button allows you to turn on the lights manually if needed. The timer to close feature is built into the wall button which allows you to set a pre-determined time to elapse before the door starts to close. This is a great feature if anyone in your household tends to leave the garage door open. The safety sensors included are designed to prevent the garage door from closing on people or pets. They are mounted six inches off the ground and when something crosses the beam, the garage door opener will reverse direction and start going back up. Chamberlain includes convenient snap on brackets that allow you to mount the sensors to the garage door tracks. This will save time on installation and help keep the sensors far enough from the garage door while it’s moving to prevent interference. Safety sensors on garage door openers are only active on the close cycle. The back up battery included with the Chamberlain B970 garage door opener will come in use if you have a power outage. You will be the envy on the block when your garage door goes up while your neighbors are stuck in their garages. This convenience feature allows life to go on as usual until the utility company can get the power restored. Chamberlain company offers some of the easiest garage door openers to install. They provide outstanding technical support online and over the phone to assist with full installation, programming accessories, and diagnosing common issues. Their website is also loaded with owners manuals and technical articles for setting up and configuring any product they offer. Chamberlain garage door openers feature a unique snap-lock rail assembly that does not require tools to assemble. The remotes come pre-programmed for convenience. The safety sensors snap onto your garage door tracks for ease of installation and to provide a secure fit. The Chamberlain website or YouTube channel offers installation, programming, troubleshooting, and how to videos to help assist with any problem that may arise. There are many professional videos to walk you through the process and phone support to help if you get stuck. After the opener is installed you can watch one of their many MyQ videos to help connect your smartphone to your garage door opener for the ultimate experience. One of the most important aspects of any product is warranty and support... especially when that product is controlling the largest moving object in your home. The Chamberlain B970 Belt Drive Wi-Fi Garage Door Opener features a lifetime motor and belt warranty, 5 year warranty on parts, and a 1 year warranty on accessories. The Chamberlain brand is well known and distributed through the U.S. and parts are available through thousands of LiftMaster independent dealers or online. Because of the similarities between Chamberlain (DIY brand) and LiftMaster (professional brand), any garage door dealer can repair or service a Chamberlain opener. The two brands share many features and benefits. What many people don’t know is Chamberlain, LiftMaster, and Sears Craftsman garage door openers are all made by the same company… The Chamberlain Group. LiftMaster is the professional version of Chamberlain and only sold through independent dealers. The only difference you are going to see between the two brands is LiftMaster uses a one-piece rail and Chamberlain uses a two piece rail. You could argue the one-piece rail is better but Chamberlain multi-piece rails hold up just fine. In fact, we have never seen one fail. The Chamberlain Group has made Sears Craftsman garage door openers for many years. Most Craftsman openers resemble the Chamberlain unit in many ways. Sears chose to go in a different direction with their remotes and some replacement parts which make their units hard to recommend. The remotes that came with previous generation Craftsman openers were never as good as their Chamberlain counterparts and some of the replacement parts in the unit were slightly changed to the point you had to order parts from Sears which could take 4-6 weeks. For this reason, we always recommended Chamberlain openers over Sears Craftsman. The most common height for residential garage doors is 7 feet tall. If your garage door is 8 feet tall, you will need to purchase the Chamberlain 8ft Belt Drive Extension Kit. The extension kit will provide additional parts so your garage door will open the full height when using your Chamberlain opener. If your garage door height is over 8 feet tall, you will need to purchase the Chamberlain 10ft Belt Drive Extension Kit. This will provide the longer rail and belt to accommodate garage doors up to 10 feet tall. Where Can I Find a Professional to Install My Garage Door Opener? Amazon Home Services offers garage door opener installation at an affordable price. They use professionals in your local area that have passed a 6-point criminal background check and they are required to maintain all necessary liability insurance and licenses for their respective area. You can request free estimates upfront and pricing is transparent so there are no surprises. Amazon installers are required to offer the same price as Amazon.com and after the service is complete, Amazon will charge your credit card on file. Amazon Home Services provides a Happiness Guarantee that allows you to file a claim if you are not happy with your services. You can also leave a review on Amazon’s website which will be verified for accuracy. Amazon’s Home Services program is a great way to get in contact with quality professionals while leaving the worry behind. The Chamberlain MyQ app is free to download and use. If your Chamberlain garage door opener has Wi-Fi built in, it will walk you through how to set up the opener with the app. If you are looking to integrate the garage door opener with other smart home devices and services then you will have to pay a monthly fee. The Chamberlain B970 Belt Drive Wi-Fi Garage Door Opener checks all the boxes when it comes to features and benefits. The ultra-quiet belt drive system will ensure that family members stay asleep while the 1 1/4 HP motor is ready to lift large doors with ease. Smartphone control and monitoring with built in Wi-Fi allows for the ultimate in convenience while the integrated battery backup will get you out of the garage in a pinch. Open your door today with the best garage door opener on the market.